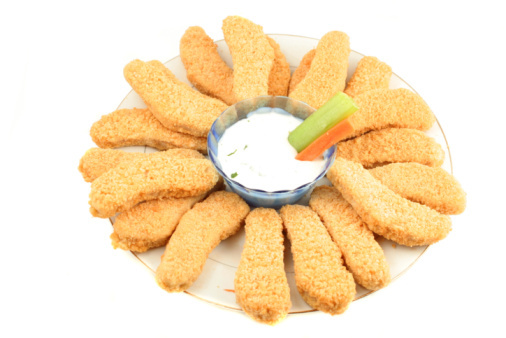 Crispy chicken strips are ranked amongst the most popular snacks. If you fail to get it from a nearby restaurant, there is no need to get worried as you can cook them in your house. Follow this easy technique to help you cook crispy chicken strips. Take the 3 lb chicken breasts and slice them lengthwise into strips. You can slice them according to your desire. However, slicing the chicken breasts into fourths is easier. Next you need to scramble the eggs. For this purpose take a large bowl and crack the three large-sized eggs in it. Then you need to mix them until the liquid turns completely yellow. Take a fork in order to properly blend the eggs. After scrambling the eggs, you need to add milk, one tablespoon of salt and one tablespoon of grounded pepper in the bowl. You need to add 1 teaspoon of milk for every egg you scramble. In case you are willing to add other spices, you can add them now in the egg mixture. Now you need to take another large bowl and add four and half cups of flour. Take a frying pan and pour frying oil in it. First you need to heat the pan to medium heat without oil in it. Then slowly pour oil in the pan. You are required to add the amount of oil in which the chicken strips are completely covered. Next you need to dip the chicken pieces into the egg mixture and then into the flour. After preparing the chicken strips, you need to place them in the frying pan. You are required to fry them for seven minutes. Later you need to flip the chicken strip and fry for another seven minutes. In the end you need to take the strips off the pan and let the oil drip. Then place them back in the pan. When you want to eat them, you can take the strips from the pan and into your plate. 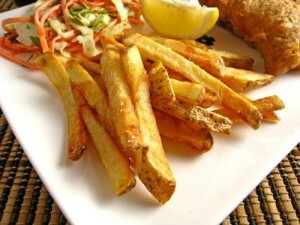 Crispy chicken strips along with french fries is the perfect mid-day snack for you.